POSTED: Thu, 11/05/2015 - 16:00 | POSTED BY: Traci C.
Get ready for your holiday trip with this new e-book! 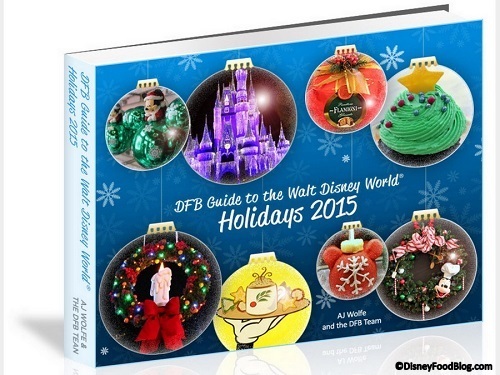 The DFB Guide to the Walt Disney World Holidays 2015 e-book is that tool! Today is the grand launch of the latest guide from our friends at the Disney Food Blog. The Holiday Guide features more than 330 pages of information on all the holiday food and events at Disney World in November, December, and January! The guide includes detailed descriptions and photos of every holiday event and activity at the parks and resorts, tips on how to make the most of your time and money, a "New for 2015" chapter, a comprehensive holiday dining section, tips on where to dine without reservations, and so much more! Other features in the book include the 10 must-eat snacks this holiday season, a three-month schedule of events, updated scavenger hunts for all the theme parks, and even a preview of the 2016 holidays. The DFB Guides are instantly downloadble PDFs that can be viewed on a computer, smartphone, or tablet. And they come with a 100 percent money-back guarantee if you aren't completely satisfied. To celebrate the grand launch of the DFB Guide to the Walt Disney World Holidays 2015 the Disney Food Blog is offering the guide for 20 percent off the cover price! Use the code PEPPERMINT at checkout and you'll get the Holiday Guide for $11.95 (regular cover price is $14.95). Are you visiting the Walt Disney World Resort this holiday season? Let us know in the comments.